Summary: When Amelia Tate is cast to play the Audrey Hepburn role in a remake of Roman Holiday, she feels as if all her dreams have come true. She has a handsome boyfriend, is portraying her idol in a major motion picture, and gets to live in beautiful, Italian city of Rome for the next two months. I have enjoyed some novels by Anita Hughes over the past few years, and her latest ROME IN LOVE definitely appealed to me. I love books set in Italy and it doesn't hurt that the cover is absolutely gorgeous. But that's no surprise! If you check out the covers of Ms. Hughes' books, they are always stunning! 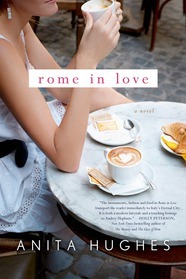 ROME IN LOVE is a charming story that fans of Roman Holiday will love. In this novel, Amelia Tate is cast to play the role in the movie that Audrey Hepburn made famous. Amelia's life is seemingly perfect -- she's an up-and-coming actress, she's engaged to a great guy, and she gets to film in Rome for two whole months. That's not to say that Amelia doesn't have concerns though. It's a lot of pressure to take on such an well-known role played by such an iconic actress. In addition, her boyfriend is less than thrilled with her newfound fame. Fortunately, she finds a friend in Sophie, a young woman who is a bit of a crossroads too; and together, they see Italy and great time. Amelia is actually staying in the same suite as Ms. Hepburn for her stay in Rome and discovers a hidden treasure. Behind her desk, she finds letters that Ms. Hepburn wrote to a friend while filming Roman Holiday. It's difficult for Amelia to believe that Audrey Hepburn had similar concerns and issues, but she finds comfort in the notes. Amelia ends up meeting a reporter named Philip one night, and instead of telling the truth about who she really is, she tells him she is a hotel maid. As the two get close, Amelia finds that it's harder and harder to tell him her true identity. However, Philip is also keeping a secret or two from Amelia! In many ways, ROME IN LOVE is a coming-of-age story for Amelia, and I found it very entertaining. (You know how I love coming-of-age stories!) Amelia's time in Rome forces her to evaluate what she wants out of life -- husband, career, etc. ; and the letters written by Ms. Hepburn help her to learn about what's really her priorities. It's a cute, quick read that's perfect for the summer. Probably my favorite thing about ROME IN LOVE were Ms. Hughes' descriptions. As someone who dreams about visiting Rome, I loved everything she wrote about the city -- the people, the building, and most definitely the food! As I read this novel, I was longing to visit Italy (which isn't going to happen anytime soon), but even worse, I wanted to eat non-stop! I say this jokingly, but I dare you not to be hungry while reading this book! I also really appreciated how the author brought Audrey Hepburn and Gregory Peck to life in the story through Ms. Hepburn's letters. It was fun to imagine them making this movie and the early days of their friendship. I liked how the letters mirrored much of what was happening in Amelia's life but were different enough that I could make my own conclusions. I also enjoyed seeing how Amelia used what Ms. Hepburn lived through to help her figure out her own life. ROME IN LOVE would make a cute book club pick -- and just imagine the food and wine you could serve! It would also be fun to discuss the book and watch Roman Holiday. There is a reading guide available if you want a little help with coming up with discussion topics. Some of the themes you might want to discuss include dreams, honesty, break-ups, pressure, family expectations, staying true to one's self, and of course love! If you are looking for a light, but very enjoyable, read these last few days of summer, then I definitely recommend ROME IN LOVE. This sounds like a great story set in a great place! I agree that this could make for a really fun book club meeting.